A cereal crop trial site open day is being held at Much Wenlock on Tuesday 29th June to give arable farmers from across the West Midlands and Welsh Borders the ideal opportunity to see how the latest winter wheat and barley varieties manage under local growing conditions. A large number of new and established winter wheat and winter barley varieties are being grown under a range of input regimes at the trial site at Walton Grange, which is run by Syngenta in conjunction with Wynnstay Arable. “This year’s open day will give cereal growers from across the region the chance to view a wide selection of winter wheat and barley varieties being grown under local conditions. By seeing the crops in situ, growers will be able to select the right variety according to their specific requirements and to suit their growing conditions,” explains Richard Torr, arable seeds manager for Wynnstay. The one-day event is being held at Walton Grange on the A458 Much Wenlock to Bridgnorth road by kind permission of Mr Arthur Hill on Tuesday 29th June from 11:00am to 5:00pm. 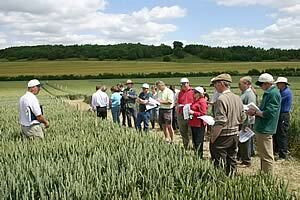 All cereal growers are welcome to attend and refreshments will be available throughout the day. NRoSO points will be available for sprayer operators.